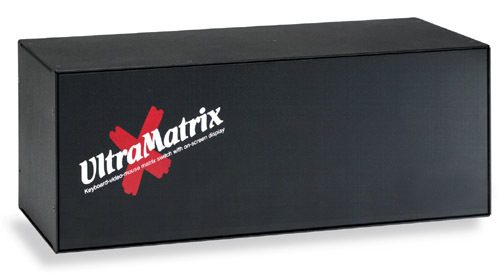 UltraMatrix offers KVM switch technology with the ability to connect up to sixteen non-blocking connections between keyboards, monitors, and mice to as many as 1,000 computers. UltraMatrix reduces clutter, saves physical space, and reduces equipment and power costs. The advanced design of the UltraMatrix uses networking communication technology to reduce cost, eliminate single points of failure, and give you direct access to your computers without hassles. The UltraMatrix is a series of modular chassis on a redundant bus, which allows maximum flexibility in customizing a system for your requirements as well as eliminates single points of failure. Switching between hundreds of computers is actually very easy with hot-key commands or using the easy to navigate on screen display. Use the On Screen Display (OSD) to access computers, monitor system status, view user-configured computer names, security, appearance, screen saver and many other features with ease and style. The OSD gives help messages to indicate the status of all connections. To allow maximum versatility, users can connect in four different modes: view, share, control, and private. UltraMatrix is compatible with PCs, Mac, Unix, Sun platforms as well as virtually any operating system including DOS, Unix, Novell Netware, Windows 95/98/NT/2000, MacOS, Linux and more.